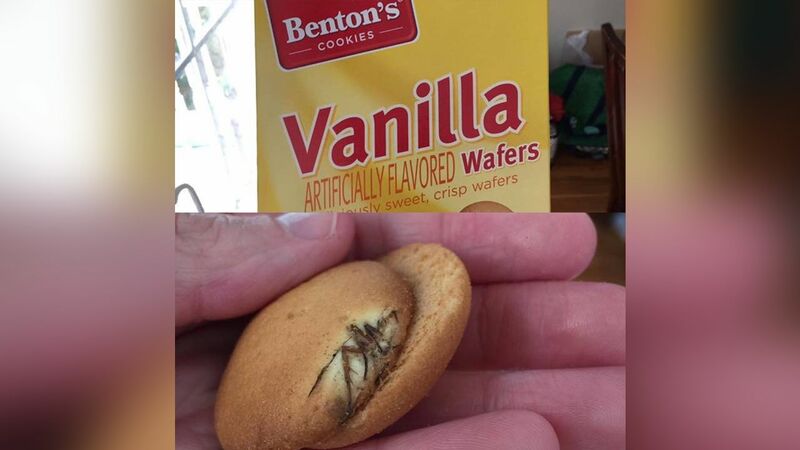 LINDENHURST, NY -- A grocery store chain said it is investigating a customer's complaint that a bug was found in a box of vanilla wafer cookies purchased at a store in New York City. Eric Sowa, said his family opened the box of cookies last Thursday when his 9-year-old daughter wanted an after-school snack. That's when they found the bug, which he said appears to be a spider baked into the cookie. The cookies were purchased at the ALDI store in Lindenhurt. Sowa said his wife, Elizabeth, contact ALDI headquarters, and they offered her a $5 coupon and said the manufacturer would be in contact. As of Monday afternoon, Sowa said the company has not contacted his wife. "There has been no communication, nor the store saying they would pull any inventory or notify," Eric Sowa said. He added that the $5 coupon was "laughable" and that his daughter has been upset after coming close to eating a "spider cookie." At ALDI, we take the safety and integrity of the products we sell very seriously. That's why every private-label food product we sell comes with the ALDI Double Guarantee, which means we will replace the product and refund the purchase price of any ALDI food product if a customer is not 100 percent satisfied. Our understanding is that this is an isolated incident and our supplier has reached out to the customer to investigate the matter further. We sincerely regret any inconvenience or concern this situation may have caused.